Secret Invasion was a massive Marvel event and one of my personal favorites. The story had elements from some classic science fiction stories like "Invasion of the Body Snatchers" and "War of the Worlds". The idea of Secret Invasion is that some heroes, and government officials had been replaced by aliens imposters. The aliens used for the story were the shape changing Skrulls. The Skrulls have history going all the way to the early Fantastic Four days of the Marvel universe. Some of the imposters had been in place for years and for a multitude of comics. Bendis the writer of Secret Invasion and its mastermind had prepared for this event for years. Hints of Secret Invasion were peppered into his entire New Avengers run. All of the preparation made for a fun, intrigue filled event where everyone debated who was a Skrull and who was not. On top of infiltrating the Earth in various sneaky ways the Skrulls also created a huge amount of super Skrulls with powers similar to those of the Earth heroes. This led to a massive menagerie of fascinating Skrulls to look out for. I remember just looking at big splash pages of Skrulls trying to pick out what power sets they were using. Also the overall promotional art was beyond anything seen in any event before or since. With catch phrases like: EMBRACE CHANGE and WHO DO YOU TRUST Marvel release a variety of posters and online pictures that hinted at an entirely new universe. A universe where the Marvel Heroes have potentially lost? Skrull propoganda! It was everywhere and in my opinion AWESOME. Though it was a little creepy....ok Creepy Awesome! 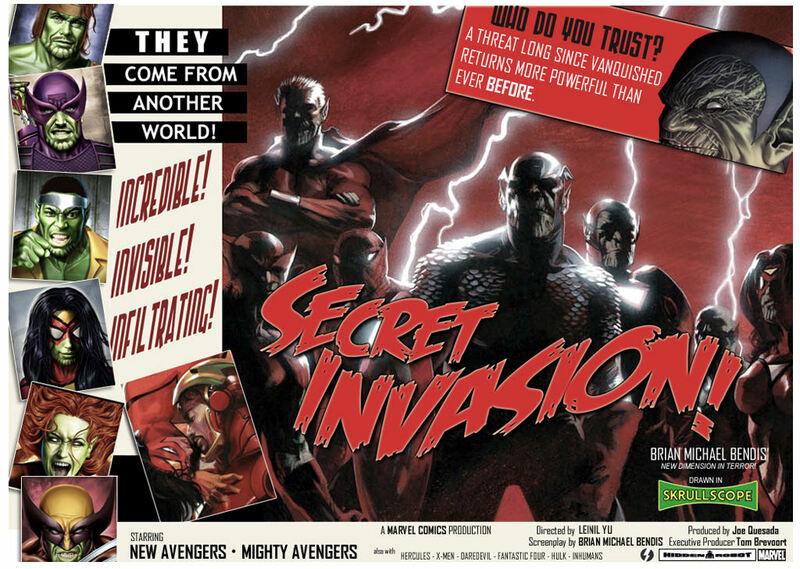 Secret Invasion Promo Posters WHO DO YOU TRUST? Like many mysteries Secret Invasion began with a death. 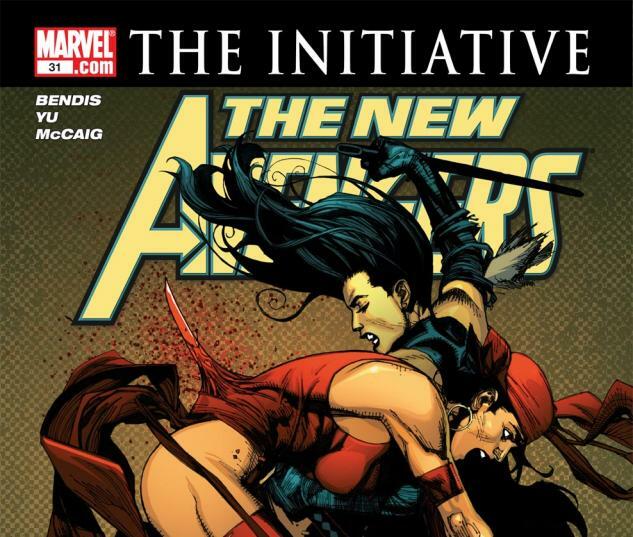 In New Avengers #31 Echo stabs and kills the leader of the Hand, Elektra. The dead Elektra falls to the ground. The Avengers and the Ninjas then all react in shock as the body changes to that of a dead Skrull. The Avengers all knew what a Skrull was but they had thought that Skrulls had long since been defeated and left Earth. Seeing a Skrull on Earth that had successfully impersonated the leader of the Hand opened up many questions. Were there others? and if there were who were they? Also how many were they and what did the Skrulls want? The Skrulls home world had been destroyed by Galactus. Their ravaged empire pulled together its resources in a bid to conquer the planet Earth that what they believed to be part of their manifest destiny. While lacking the power to outright conquer Earth the Skrulls would use their dynamic genetics, advanced science and magic to create highly undetectable powered agents that could replace various members of Earth's political and hero groups. This would lead to wide spread distrust amongst heroes and fracture them as the main Skrull force descended to conquer the planet. The two Avenger teams New Avengers and Might Avengers already were distrusting each other after the events of Civil War. The New Avengers were led by Luke Cage and was made up of supporters of Captain America, and the Mighty Avengers were led by Tony Stark. As the New Avengers fly home on their jet, Spider-Woman sneaks off the plane with the Skrull body. She shows up at Tony Stark's head quarters with the Skrull body and gives it to him. She claims this move was done to to bring in Tony and his forces to prevent an invasion. The action however sows distrust amongst both the New and Mighty Avengers as well as SHIELD. Spider-Woman is revealed to be the main agent of the Skrull Forces she is the Skrull Queen Vernake who planned the entire invasion of Earth. The heroes manage to force out a group of Skrulls attempting to mine Vibranium from the Savage Land. However the heroes are then attacked by ship of Skrulls that are posing as Heroes. Meanwhile the Illuminati are entangled with a battle with a Skrull Black Bolt. Both events further destabilize the heroes as the Skrulls ready for the main attack on Earth. The Earth's defense forces are destabilized after a series of sudden defeats. Just as Mister Fantastic is about to find a way of detecting the Skrulls is shot by Hank Pym who is revealed to be a Skrull agent (Criti Noll). Armies of Skrulls land on Earth that are made up of advanced Super Skrulls. These Super Skrulls have various hybrid powersets of the Earth heroes. After numerous battles with the Skrulls the tides finally begin to turn. The leader of the criminals the Hood organizes the super villains against the Skrulls. Nick Fury who had seemingly disappeared emerges with a group of unknown heroes called the Secret Warriors. Both groups help turn the tide. The heroes are finally able to trust each other when Mister Fantastic returns with a device that reveals the Skrulls. As the tide begins to turn the Skrull agent Criti Noll pulls out an ace up his sleeve he activates a program in Wasp that turns into a biological super bomb. Thor is able to block the damage of the bomb but is not able to save the Wasp. Watching one of their own die in such gruetesque fashion infuriates Earth's forces and they begin to crush the Skrull forces. Hawkeye / Clint Barton manages to wound the Skrull queeen Vernake. Norman Osborn emerges with a special gun (Stolen by Deadpool in a side story) and infront of the world's news shoots Vernake in the head and killing her. The Skrull forces collapse without their leader. Norman Osborn's high profile killing Vernake leads to him being appointed to the highest security clearance of Earth's forces and the age called Dark Reign begins.